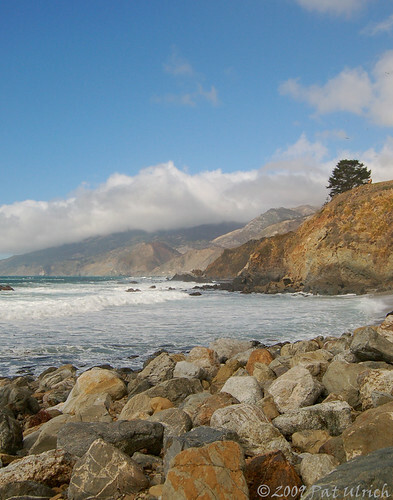 We had a really nice drive through Big Sur over Thanksgiving weekend -- it was the first time that I have done the whole distance, and I didn't realize how much of the area is forested. 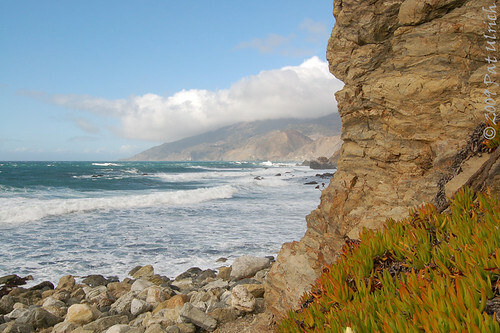 As it turns out, Los Padres National Forest covers nearly 2 million acres of the Big Sur area, and 220 miles of coastline! We stopped for lunch in a large pull-out area on a bluff-top overlooking the water near a sign that mentioned something about sea otter habitat (we didn't catch it all as we drove by). While we didn't see any otters (or at least any that looked different from all of the bobbing kelp! ), we did get nearly blown away by the strong winds. All day we had been at the trailing edge of a storm that was heading south down the coast as well, which made for some pretty skies of sunshine and storm clouds for most of the trip, but also kept things really windy. One interesting thing of note at the pullout is that there were two "chairs" made from some giant tree stumps that had been placed to look out over the water. In the short time that we were parked there (by the stumps since it was at the end of the lot) no fewer than three cars also pulled into the area then got out and took their pictures on the stumps, then left. I'm not sure if they realized they had an audience or not, but we got to watch each group brace themselves into the wind, pose with hair flying everywhere, then move on. Not to be outdone, we took a few shots on the stumps before we left as well.